Co-host Savannah Guthries raised the obvious comparison: "Well, a lot of people may recognize some contours of this character, shall we say. Your character is a former first lady, a former presidential candidate, and a current secretary of state." Weaver initially insisted: "And that's where the comparison ends." After acknowledging how Clinton "inspired" the show, Weaver added: "...it is a tribute to politicians like Mrs. Clinton, but it's – it's both sides. It's the light and the dark." Near the end of the interview, Weaver praised her latest role: "This is the first character I think I've ever played who's so in the mainstream. Who's so, I mean, you could say that she was like the perfect girl scout who grew up to be, you know, this woman with a great passion to serve the public." 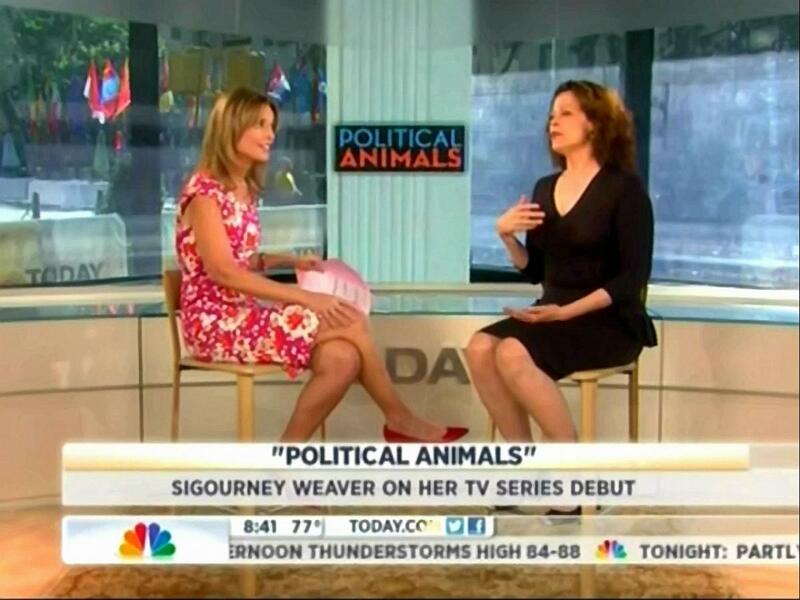 SAVANNAH GUTHRIE: And coming up, Sigourney Weaver is here. She has a new role on a USA Network drama, she plays a former first lady turned secretary of state. Now where have we heard that before? We'll ask her how she came up with the role and how she likes it. So we'll catch up with her in a minute. GUTHRIE: Back now at 8:39 with Oscar-nominated actress Sigourney Weaver. She makes her television series debut in USA Network's Political Animals, playing a former first lady and current secretary of state. And the pressure to balance her career and personal life can sometimes become too much. SIGOURNEY WEAVER [PLAYING ELAINE BARRISH HAMMOND]: You could have gotten yourself fired for that kind of behavior in front of the President. He's not just a boss. He's not your floor manager at Chili's, he is the President of the United States. And whether or not this administration is trading on my popularity is not what matters now. All that matters now are the three scared, innocent people sitting in a jail cell in Tehran wondering what the hell their country is doing to help them. Are we clear? GUTHRIE: Sigourney Weaver, good morning to you. WEAVER: Good morning. How are you? GUTHRIE: Your first television series. What made you take this leap? WEAVER: You know, the series is about this political family that was in the White House and that sort of wants to get back in there again. And it's so delicious and juicy and I don't know, there's – I haven't ever been offered material that's like this, you know. Elaine Barrish Hammond is this very gifted politician with a very strong moral compass. She really brings the right kind of leadership to Washington, which is part of the appeal to me, because I think more women should run. But she's also the matriarch of a very vivid, dysfunctional family. And we have such a wonderful cast. And in the hands of Greg Berlanti, our creator, the scripts are just – I would have to say it's like, you know, after a couple of years of eating salads, suddenly to get a big juicy steak. You know, it's really been great. GUTHRIE: Well, a lot of people may recognize some contours of this character, shall we say. Your character is a former first lady, a former presidential candidate, and a current secretary of state. WEAVER: And that's where the comparison ends. GUTHRIE: I know a lot of reporters say to you that you are known for playing strong women. But you look at it a little bit differently? WEAVER: Well, you know, I feel women are strong. I mean, look at you, you're my height, 6 feet tall, practically. You know, I'm surrounded by women in my life and in the world who have jobs, who take care of their families, who support their communities, who champion causes. I mean, there's so much we do. And I've always felt if you really want to get something done, you ask a mother to do it. And so I feel like that's the kind of energy I feel Washington needs. And I think part of my desire to do this show was to show what that kind of women's energy can do in Washington, which is kind of stuck. GUTHRIE: You have had so many great memorable, unforgettable roles. Is there one in particular that you hold closest to you that you love the most? WEAVER: Well, right now I have to say it's Elaine. You know, usually I'm playing people who, I have to say in a nice way, are quite eccentric, or they're, they've been put on the periphery for some reason. This is the first character I think I've ever played who's so in the mainstream. Who's so, I mean, you could say that she was like the perfect girl scout who grew up to be, you know, this woman with a great passion to serve the public. And so it's been wonderful to play that, because that's actually not an easy thing for me to do. GUTHRIE: You make it look easy all the time. WEAVER: Well, you're very kind, you're very kind. GUTHRIE: Sigourney Weaver, it's wonderful to meet you in person. WEAVER: It's great to meet you, too. GUTHRIE: And we should remind everybody Political Animals premiers this Sunday, 10:00/9:00 Central Time on our sister network USA.